Black History Month was first officially recognized in Canada in 1995 following a motion introduced in the House of Commons by the first Black Canadian woman elected to Parliament, the Hon. Jean Augustine. Parliament subsequently and unanimously carried the motion. Recognized every February, Black History Month encourages people to celebrate the many achievements and contributions of Black Canadians who, throughout history, have done much to help create a culturally diverse and compassionate nation. The month also reminds Canadians of the long history of Black settlement and achievement in Canada and prompts citizens to reflect on the painful fact that some African people were once enslaved in the territory that is now Canada. Throughout February, we hope to recognize on our social media channels just a few of the many individuals of African and African-Canadian descent who have been students of Pearson College UWC. We cannot do justice to this entire cohort of students from the last 45 years, but we hope to offer a small sample. 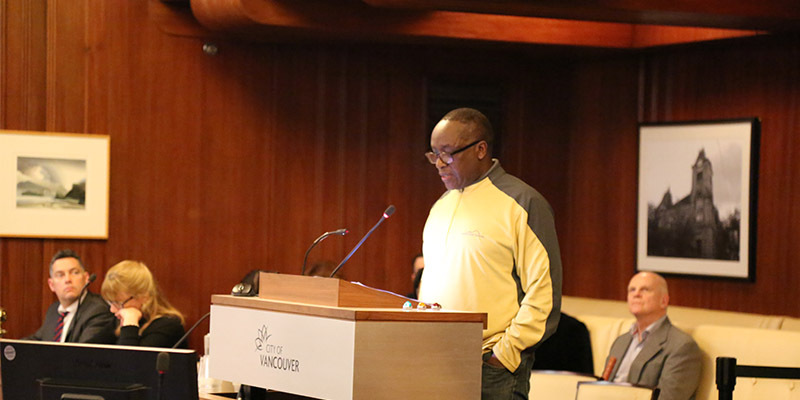 In this edition of Pearson eNews, we are highlighting Lama Mugabo (YR2/1977, Rwanda), who has been active on social justice and poverty alleviation issues in Vancouver’s Downtown Eastside (DTES) for decades and has worked to build meaningful bridges between his Rwandan homeland and Canada. Lama is a lifelong activist and involved in so many initiatives that are enough for two stories. Watch for Part 2 in the February Pearson eNews. Vancouver is Canada’s largest west coast city and one of the country’s major centres, but few people, including many in that city, know that it was once home to a thriving Black community that over the years faded away and was largely forgotten. But Pearson alum Lama Mugabo (YR 2/1977, Rwanda) knows all about Hogan’s Alley, because he is front and centre in current efforts to recognize and honour this community by establishing a permanent Black Cultural Centre and fighting for affordable neighbourhood housing that will prioritize access for people of African-Canadian descent. “You know, with no black cultural centre in Vancouver and February being Black History Month, every year we struggle to fit everything cultural about Black people into the shortest month of the year and we never succeed,” said Lama with a smile in his voice. He noted that a community centre would not only revitalize the local area but would also feed into a demand across the Lower Mainland (Metro Vancouver and Fraser Valley) from people of all backgrounds to learn more about Vancouver’s heritage and history. “Whenever we organize events we sell out – so many people want to come out, so many people are curious to know more about the community,” added Lama. While there were many historical factors at work, Lama pointed out that a major factor contributing to the displacement of the community was the construction of a viaduct in 1915 and its replacement by the Georgia and Dunsmuir street viaducts in the late 1960s/early 1970s. Each project, in its own way, had a direct negative impact in disrupting neighbourhoods such as Hogan’s Alley, neighbouring Chinatown and the adjacent Gastown and Downtown Eastside (DTES) areas. In fact, in 1967, 15 city blocks, including the western section of Hogan’s Alley, were leveled to clear the way for what later became part of a waterfront freeway right-of-way that would almost certainly destroy a good deal of the housing stock and available land near downtown Vancouver. What amounted to a typically polite and thoughtful Canadian citizens’ uprising in Vancouver led governments to shelve the entire freeway project but leaving the twin viaducts in place leading to and from surface streets in both directions. A little over three years ago, Vancouver City Council voted to demolish the viaducts and embark on a revitalized residential neighborhood plan. The design phase is underway with construction not expected to begin until at least 2020. That’s where Lama and his peers re-enter the picture. Vancouver’s DTES is commonly regarded as the poorest postal code district in Canada. Though a strong and distinct neighbourhood, its stock of “relatively affordable” rental housing has long attracted individuals and families with low incomes and, in some cases, mental health, addiction and other health challenges. While these realities cut across all ethnicities and backgrounds, Lama allowed that the opportunity to serve the community through opportunities to access affordable, stable housing, in both the short term (through modular housing) and in the longer term through a design process that will include social housing components, is important. “I tell you, it is so gratifying to be able to offer service to people who have been marginalized for so long. When you tell them about this opportunity, they can’t believe it – they think they’ve died and gone to heaven. It’s amazing. Having access to safe, stable and affordable housing is a critical factor in a person’s ability to look after themselves and their mental health. According to the Canadian Mental Health Organization, good housing can help rebuild and maintain independence, day-to-day routines, confidence and social networks. Next month, we will focus on Lama’s work in Rwanda, Vancouver’s DTES and on a new food security initiative that is reaching out to First Nations communities in British Columbia.